For the administrative subdivision, see Damghan County. "Damqan" redirects here. For the village in Qazvin Province, see Damqan, Qaavin. Damghan (Persian: دامغان‎, also Romanized as Dāmghān) is the capital of Damghan County, Semnan Province, Iran. At the 2006 census, its population was 57,331, in 15,849 families. It is situated 342 kilometres (213 mi) east of Tehran on the high-road to Mashad, at an elevation of 1,250 m (4,101 ft). It is one of the oldest cities on the Iranian plateau, stretching back 7000 years, and boasts many sites of historic interest. The oldest of these is Tappeh Hessar, lying to the southeast of the city, which holds the ruins of a castle dating from the Sassanid period. The Tarikhaneh is one of the oldest mosques in Iran, built as a fire temple during the Sassanid dynasty it was converted into a mosque after the advent of Islam. There are also many other historical buildings belonging to Seljuks and other periods. Apart from its historical interest, the city today is mainly known for pistachios and paper almonds (kaghazi) with very thin shells. The name Damghan comes from "Deh" and "Moghan". "Deh" means village and "Moghan" means Magi. This name was given by Zoroastrians, who included such people as King Cyrus and Darius of ancient Persia. Historiographers ascribe the construction of Damghan to Hooshang, Keyumars' great grandson and the founder of the legendary Pishdadi dynasty. The historical town was called Qumis, which was located in a region of the same name, stretching from Sabzevar to Garmsar, from north up to Alborz Mountain Range and to the Lut Desert in the south. Up to the 1st century AD, Damghan was the capital of that great province. During Alexander of Macedon's invasion into Iran, the Greeks called it Hecatompylos ("hundred gates"). The Greeks called every big and important city Hecatompylos and they have recorded a similar big and bustling Egyptian city with that appellation. Damghan was half destroyed in the 856 Damghan earthquake. Damghan was an important city in the Middle Ages, and was the capital of the province of Qumis (Qoomes), but was destroyed by the Afghans in 1723. Few remnants of that time remain; one is the ruined Tari-khaneh mosque. Damghan shines like a bezel in the desert region. With its ample cultural heritages and authentic background Damghan's ancient civilization is undeniable and each relic in the city can substantiate its genuine past. By rubbing the dust of forgetfulness off this shining bezel we can display Damghan's ancient shining face to the world and introduce it as an important tourism and sightseeing place in Iran. Of historical treasures in Damghan one must refer to the valuable Tappeh Hessar (Tepe Hissar), which was already inhabited in the 5th millennium in the Chalcolithic period. Tappeh Hessar, with several layers of civilizations, is hiding a long history in its bosom. There was metal production already in its earliest period. There are also several associated sites, such as Shir Ashian Tepe, another small settlement in the area, dating to the same time. Part of the layers in the Tappeh belong to the Mades dynasty, which shared its civilization with Mesopotamia. Another layer covers the Achamenid, Parthian and Seleucid periods. Tappeh Hessar achieved its peak of glory during the Seleucid and Parthian periods. During the reign of Arsaces II, Damghan was the capital of the Parthian Empire in Iran. With the discovery of relics from that period, one comes across another layer, which is ascribed to the Sassanians. Historical excavations has shown that the history of Damghan starts 4–5 thousand years BCE. For example, Carbon 16 isotope inspections in Tappeh Hessar have revealed items belonging to 7,000 years ago. Recently expansion of Tehran–Mashhad railway into double lanes the body of a woman along with her fetus was discovered with over 7,000 years age. Scientists have discovered metal in her teeth, which leads us to believe that she was the goddess Tootam. Tootam worship was a religion which prevailed among the Iranians, Egyptians and Indians many thousand years ago. Professor Hertzfeld (1931-1933) and Dr. Schmidt (1933–1938) were the first archaeologists who explored the Tappeh. An archeological dig here in 1996 revealed remains dating from the time of the Aryan settlement of the Iranian plateau (circa 4000 BCE) to the Median (728-550 BCE), Parthian (248-224 CE) and Sassanid (224-651 CE) dynastic periods. Tarikhaneh Mosque is the oldest mosque in Iran, belonging to the 1st century after arrival of Islam. It still preserves its original shape, with a number of massive columns and wood carvings and two minarets of the 11th century. The prefix "Tari", a Turkish or Mongol term, means God and "khaneh" is Iranian word for house, so the word means the house of God. Tarikhaneh and Na'in Mosque in Na'in are the only mosques in the Islamic World which resemble the Medina Mosque. This mosque was built during the 8th century AD by imitating Roman, Iranian and Arabic architecture. This is an Arabic design but the building material and architecture is Sassanid. This leads us to believe that originally it had been a fire temple during the Sassanid period, and later the mosque was built over its ruins. One column resembling Sassanian architecture at the eastern wing is a proof of this assertion. Tarikhaneh Mosque is equipped with a square yard and a gallery with 18 columns facing the Qiblah and the three sides of the yard are surrounded by porticos. The minaret rising over the mosque is said to belong to Seljuks and the tiled inscription over the minaret is in fact the oldest tile work in Islamic architecture. Walls or fortifications and battlements have survived in many parts in Damghan. As mentioned in the history the wall was very wide and enabled chariots to drive over it. The remains of that wall can be seen north and south of Damghan. Much treasure has survived from the Seljuk period in Damghan. Peer-e Alamdar's Shrine (The Old Flagbearer's Tomb), Congregation Mosque or Masjed Jame, the minaret of Congregation Mosque, Tarikhaneh Mosque, Mansourkuh, Imamzadeh Jafar Tower and Chehel Dokhtaran Vault, etc. are buildings in which Islamic architecture from Seljuk period onward is notable. For the first time in Iran these buildings carry brick decorations to compensate for the monotonous and uniform rows. Chehel Dokhtaran Vault is located at the center of Damghan and behind Imamzade Jafar, both of which belong to Seljuk period. A Kufi inscription in the edifice says the vault was built in 466 AH (1087 AD) and has survived without cracks although the city is lying on the Alpide belt. North of the city, along the Cheshme Ali and Mazandaran road, there are two forts built on the top of two mountains. The first one is 5 km far from the city, on the peak of Gerdkuh, one of the main Ismaili's Hashshashin fortress which used by Hassan Sabah. It was conquered by Hulagu Khan finally. Due to circular shape of mountain peak, it was named Gerdkuh, Gerd for circular (round) and Kuh for mountain. This shape made it very difficult to access by invaders. Another one is Mehrnegar Fort on Mansourkuh, 22 km north of city, along the roud. The mountain is Pyramid like and the fort located on its top. This was one of the fortifications of dreaded Ismaili esoteric sect during Seljuk invasion and has been named Mehrnegar because of Princess Mehrnegar's love story. Evergreen Cheshmeh-Ali is one of the permanent springs in Damghan, 30 km north of the city. Thanks to its verdant foliage and pleasant climate this region has been frequented by people from ancient times. During the Qajar period many buildings were constructed in Cheshmeh Ali among which the Fat'hali Shah and Agha Mohammad Khan palaces still stand erect. Fat'hali Shah's palace is built in the middle of a lagoon placed between the first and second spring and Agha Mohammad-Khan's palace is facing opposite the former palace. Cheshmeh-Ali has always interested the visiting tourists. Beside those mentioned above one might refer to the Gonbade Zangol, Toghrol's Tower, Qoosheh Amirabad Caravansary (A Shah Abbas, The Great era building), historical hills and hazel-shaped castles around the city as well as Gerdkuh and Masoumzadeh Mehmandoust fortifications. Damghan's bazaar contains tombs, old schools, baths and the like. Out of historical monuments in Damghan which has always interested foreign archaeologists many relics have been unearthed which are deposited in the British and French museums and display ancient Iranian civilization. The remains of Hecatompylos lie to the southwest of the city, extending from Forat, 26 kilometres (16 mi) south of Damghan, to nearly 32 kilometres (20 mi) west. On an eminence in the western part of the city are the ruins of a large square citadel with a small whitewashed building, called Molud Khaneh (the house of birth), in which Fath Ali Shah was born (1772). ^ Damghan can be found at GEOnet Names Server, at this link, by opening the Advanced Search box, entering "-3059167" in the "Unique Feature Id" form, and clicking on "Search Database". ^ One or more of the preceding sentences incorporates text from a publication now in the public domain: Chisholm, Hugh, ed. (1911). "Damghan" . Encyclopædia Britannica. 7 (11th ed.). Cambridge University Press. p. 787. ^ Bloom, Jonathan M.; Blair, Sheila S., eds. (2009). "Bistam". The Grove Encyclopedia of Islamic Art & Architecture. 1. Oxford, England: Oxford University Press. p. 291. Berney, K. A. (1996). "Damghan". In Watson, Noelle (ed.). International Dictionary of Historic Places. 4. Fitzroy Dearborn. p. 766. ISBN 9781884964039. 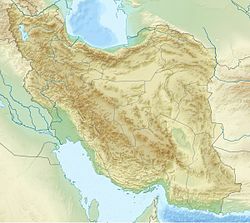 Wikimedia Commons has media related to Damghan. This page was last edited on 15 February 2019, at 06:04 (UTC).